Running reports shouldn't be hard. Split your sales with vendors easily and quickly. Great for store owners that work with artists and third-party vendors. Each line item in an order with a vendor is calculated for you. You just set the percentage and we will do the rest! View each line item in orders with vendor sales and percentages. Vendor Payout works with your existing Shopify store. Don't have a Shopify store? It takes seconds to create a free test store and try out our app! Login or install and start your free 7 day trial. Vendors can login to view sales and profits. VendorPayout works by linking the vendor name that's associated with each product. 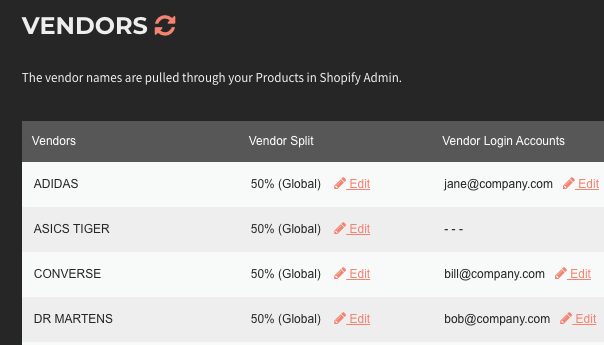 In Shopify Admin, when you create/edit a product, you'll see a field labeled VENDOR. 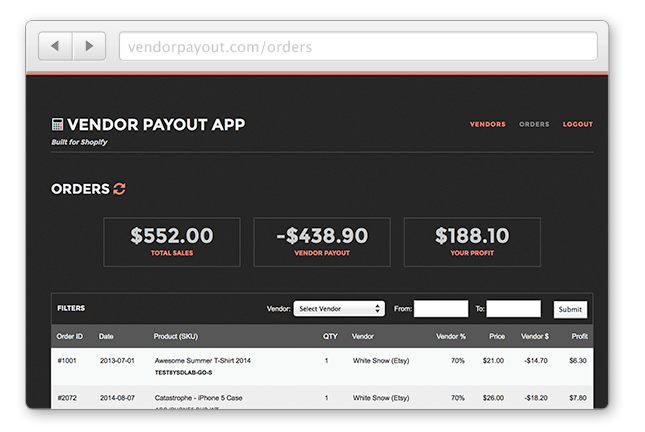 Once you have all your vendors setup, then VendorPayout will scan all your orders and calculate the breakdown for you. I just created an order and I don't see it appear on VendorPayout? VendorPayout auto syncs every morning. If you need to force a sync, you can also do so within the app's Order page. I just installed the app and it only sync my latest 250 orders. Can VendorPayout sync my past orders? Yes. Feel free to contact me if you need to sync more orders. When you first install VendorPayout, the app will sync your latest 250 orders for the purpose of speed. If you have 10,000 orders then we prefer to sync in the background instead of showing you a loading screen for 5 minutes. 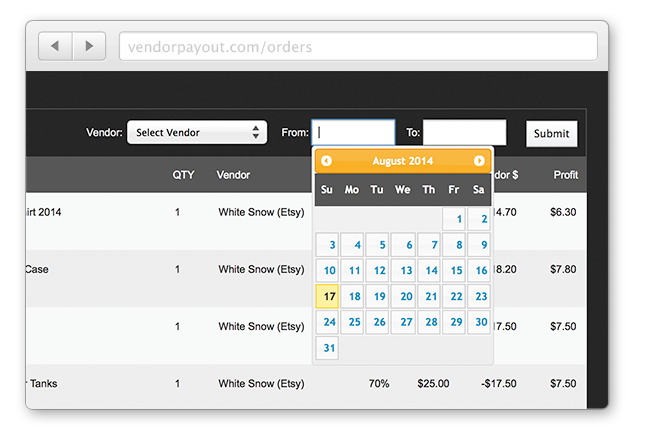 How does VendorPayout calculate a product that's on sale? VendorPayout has a settings page for you to configure if you want to perform a vendor split/calculation on the sale price or the original product price. Does VendorPayout calculate tax and shipping? No, VendorPayout just calculates on the product price. I have one order that doesn't fit the normal flow. Can I edit the calculations? Yes, you can customize and edit any order. If one Order shouldn't be paid to a Vendor, then you can edit it. Does VendorPayout have an auto-payment system? 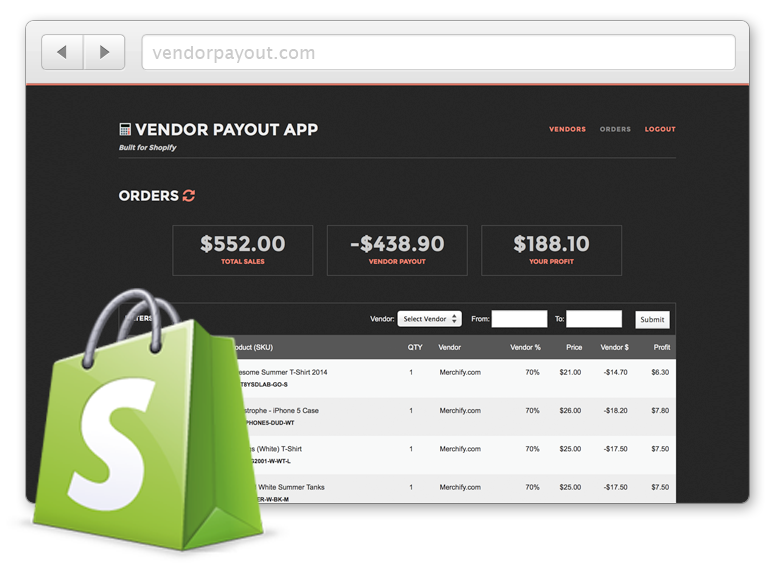 VendorPayout is just a reporting tool and does not have an auto-payout feature. Many store owners use PayPal or Quickbooks to transfer funds. The benefit of VendorPayout is that the third-party vendors can login and see all orders sold with their product. I had built a Paypal payment system in the past but then store owners had different rules on returns, cancelled, chargebacks, fraud, etc. I eventually removed that feature so now each store owner handles the transaction through their own accounting system. I need VendorPayout to split on Product Tags instead of Vendor name. Is that possible? Yes, please contact me to discuss a customize plan starting at $100/month. My calculations for Vendors are very complex. Can you perform X with Y for Z? Yes, please contact me to discuss a customize plan. No two stores are alike so VendorPayout can be tailor to fit your store's need. © 2019 Vendor Payout App. All rights reserved.